Star Wars Galaxies players are are getting some hot snowspeeder versus AT-ST combat with Chapter 11: The Battle of Echo Base. Live today, the update adds what is essentially a giant battleground, with players on both sides of the Galactic Civil War taking on quests to help their side triumph, with the Empire on assault and the Rebel Alliance on run like hell duty. 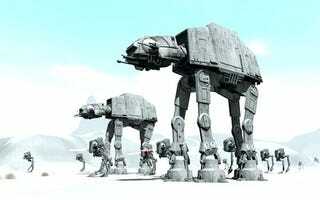 Of course no Hoth battle would be the same without giant walking vehicles being tripped by small flying vehicles. Groups of up to 8 players will be able to hop into the cockpits of Imperial walker or Rebel snowspeeders and do what comes natural. Hope they packed plenty of tow line. Honestly I'm a bit surprised this wasn't already in the game. I thought the first thing developers did upon starting up a Star Wars project based on the original trilogy was get the Hoth battle out of the way. Odd. Hit the jump for some very white screenshots. LEGENDARY BATTLE OF ECHO BASE COMES TO LIFE IN NEW STAR WARS GALAXIES CHAPTER New Hoth Encounter Lets Players Experience One of the Most Memorable Battles in Star Wars History AUSTIN, Texas — Nov. 20, 2008 — Choose your side and prepare for battle — the epic fight for Hoth is now yours to be waged! Sony Online Entertainment LLC and LucasArts today announced the latest addition to Star Wars Galaxies™, Chapter 11: The Battle of Echo Base, that brings the epic action and excitement from one of the most gripping fights in Star Wars history to fans and players in a way they’ve never experienced before. This latest chapter in the Star Wars Galaxies saga lets players relive pivotal combat missions on behalf of either the Galactic Empire or the Rebel Alliance. The breathtaking heroic encounter adds vehicular combat, so players in groups of up to eight people can jump into the fray at Echo Base and take the controls of a Rebel snowspeeder or Imperial AT-ST. The fight for both sides begins on the icy North Field, where the battle between the forces of good and evil are joined, and continues all the way to Evacuation Point, the site of the Alliance’s desperate, harrowing escape from the menacing Imperial ground assault. About The Battle of Echo Base After picking up the mission at the Adventurers’ Guildhall in Aurilia, players who have chosen a side in the Galactic Civil War will need to accomplish various objectives. Under the command of General Maximilian Veers, Imperial players must infiltrate Echo Base, taking out at many Rebels along the way as possible. Rebel players, led by General Carlist Rieekan, will need to evacuate Echo Base with as much manpower and material as can reasonably be preserved. Feature Set: • Multi-stage battle with exciting objective based-missions for both Imperial and Alliance players. • Exciting vehicular combat featuring iconic Star Wars vehicles including snowspeeders and AT-STs. • Massive gameplay area with endless replayability. • Appearances by major characters of the battle including Darth Vader, Luke Skywalker and R2-D2.